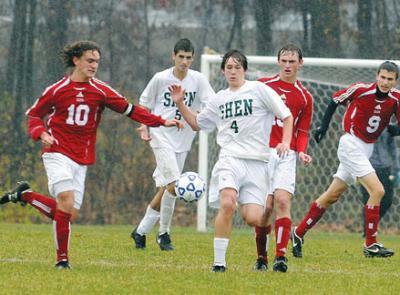 Penalty kicks are to thank for moving the Shenendehowa boys soccer team to state playoffs in Oneonta this weekend. The Class AA regional final game against Shenendehowa and Section III champion, Baldwinsville, was tied at 2-2 when they had to resort to penalty kicks. Goaltender, John Mabee, had three consecutive saves and Michael Jenkins shot the final goal to give Shen the 3-2 win. Shen has more exciting games coming this weekend. The Class AA state semifinal is at the Hall of Fame Soccer Complex in Oneonta this Saturday. Shen will take on Section IX champion Newburgh Free Academy to try and go for the win. The winner of that game will then go to play either Section VI champion Clarence or Section XI champ Brentwood in Sunday's state final. Last time the Plainsmen were in this position back in 2005, they took they won the state championship. They are hoping for a repeat visit to Oneonta this year.